Anonymous sale; Christie's London, 6 April 2000, lot 151. 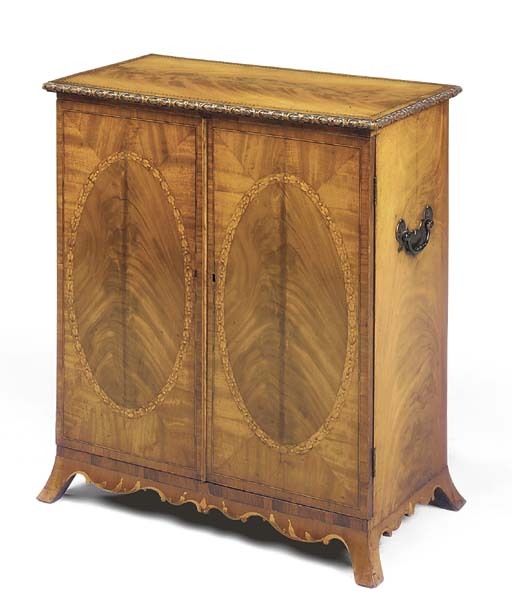 The cabinet is designed in the George III Roman fashion introduced in the 1770s and later popularised by A. Hepplewhite & Co's Cabinet-Maker and Upholsterer's Guide, 1788. The top's tablet of flame-figured mahogany is wreathed by chequer-mosaiced inlay, while the medallioned compartments on the façade are wreathed by poetic laurels, and its scrolled apron is lapped by Roman acanthus.